When you set up a personal goal at My Robo Adviser™, you are provided with a portfolio recommendation designed to help you reach your unique investment goal. The recommendation will be one of 101 models we offer. Most of these models utilize our 3-dimensional Endowment Investment Philosphy™ (See Figure 4 or click to view how the equity goal number equates to our 3-dimensional allocation models). You have the option to accept the recommendation or, you have control to over-ride the recommendation and select a more conservative or aggressive allocation. You can change your portfolio allocation at any time. To adjust an allocation, log in to your My Robo Adviser™ account. Upon log-in, you will be on your account Summary page. To view the target allocations for a portfolio from your PC, (1) click on the Advice tab from the menu bar at the top (see Figure 1), then (2) Select a Portfolio from the drop-down menu located on the left margin, (3) Click on “Target Allocation” and a drop-down menu will appear. The portfolio allocation model number (4) will appear in the Target Allocation section as a large bold number next to “% Stocks” (see Figure 2). This will be the current model number or “equity goal” setting for your portfolio. This number will range for 0% Stocks for very conservative short-term bond portfolio to 100% Stocks for the most aggressive portfolio. Note that the “% Stocks” number doesn’t necessarily mean your portfolio is invested with the stated percentage of stocks, but rather it indicates the model number or “equity goal” setting of the portfolio. This number corresponds to one of the 101 models offered by My Robo Adviser™. See Figure 4 or Click to view a table that illustrates how this equity goal number equates to our 3-dimensional endowment allocation. Below the equity goal number is your portfolio’s Overall Risk status (5) Overly Aggressive, Appropriately Aggressive, Too Conservative, etc., along with the (6) Short-term risk/return potential for this model number/target allocation in any given year. The Projection chart (7) is an illustration that illustrates the potential of a Stock-Bond portfolio over your goal period, along with various outcomes based on your current balance, forecasted deposits (if you have set up regular deposits), along with what the portfolio projection might look like if the market has poor, average or better than average outcomes, along with the chances of those outcomes, respectively. Toggle your mouse over the chart to see the various outcome probabilities at any given point on the chart. At the top of the chart (8) are the amounts to which your portfolio might return based upon Average Market Permance and Poor Market Performance. 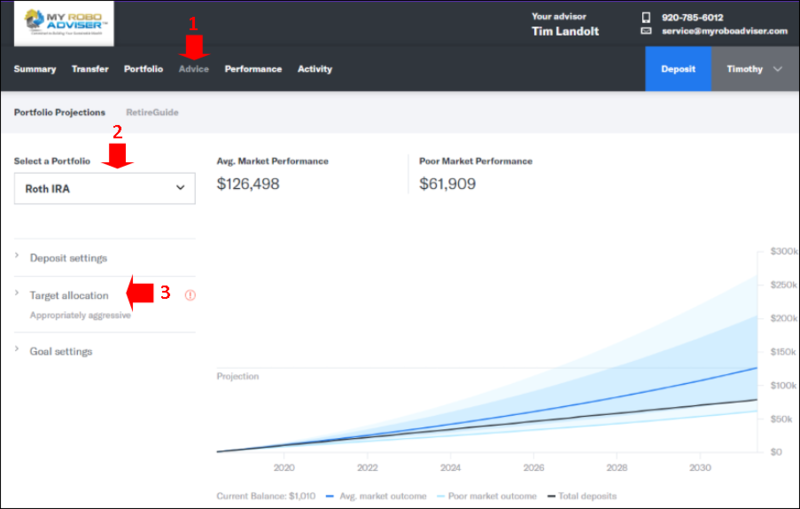 Note -Projection data illustrated in the table is based upon parameters and assumptions of a 2-dimensional stock-bond portfolio designed by Betterment. Projections are NOT derived from data based on My Robo Adviser’s 3-dimensional endowment portfolios. The actual results of your portfolio may not correlate and could be higher or lower than the projected results in the illustration. Below the Short-term risk rating is your Recommended Allocation (9), a strategic asset allocation portfolio (that equates to model number or the equity goal) appropriate for the goal and time horizon. Below the Recommended portfolio is a horizontal grey bar that represents a scale from 0% Stocks (most conservative model) on the left, with 100% Stocks (most aggressive) on the right. The darker and darkest grey sections of the bar represent a narrower range within which your portfolio is optimally calibrated to help you reach your goal. If you hover over the dot, then click and hold the left mouse button, you can slide the dot along the bar and adjust the model number or equity goal percentage. As you slide the dot, observe the “% Stocks” change to reflect other equity goal percentages. 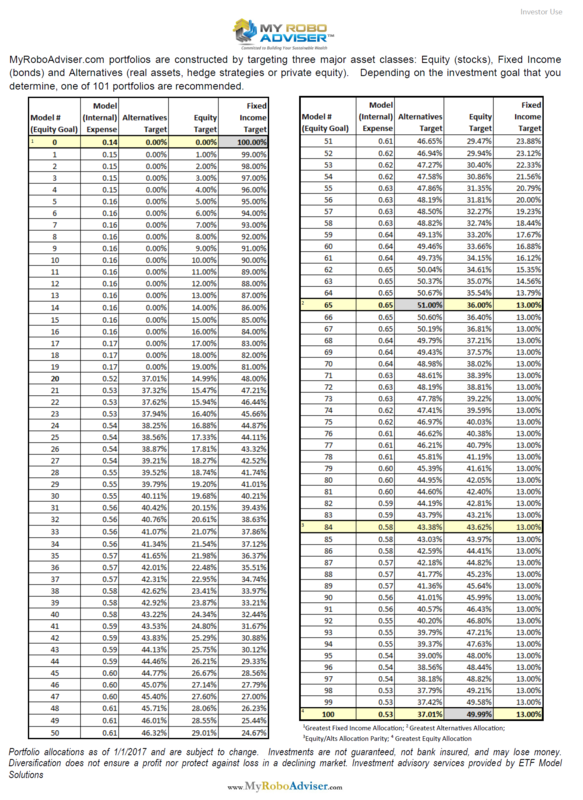 When you release the mouse, the page will reset and you will be presented with an outcome projection table containing data that corresponds to the new model number (% Stock goal). You can hover your mouse over the table (7) to view the various probability outcome ranges of the new model number. If you do not want to accept this updated setting and want to start over, click Reset All (12) and click on the Advice Tab or hit the Back button on your browser. However, if you elect to change to the new model number setting, click blue Confirm Allocation (11) at the lower left. If you click Confirm Allocation, you will see the Preview allocation page (see Figure 3). 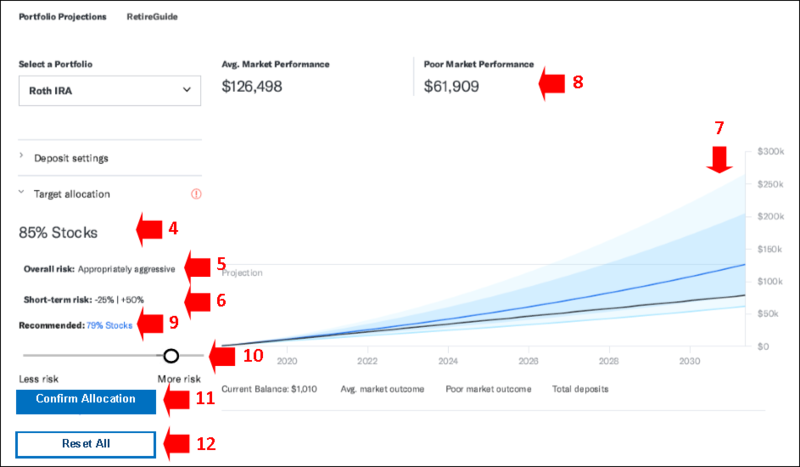 This page illustrates the new model number’s projections for Poor, Strong and Average market performance (13), along with an Overall Risk and Short-term risk range (14). 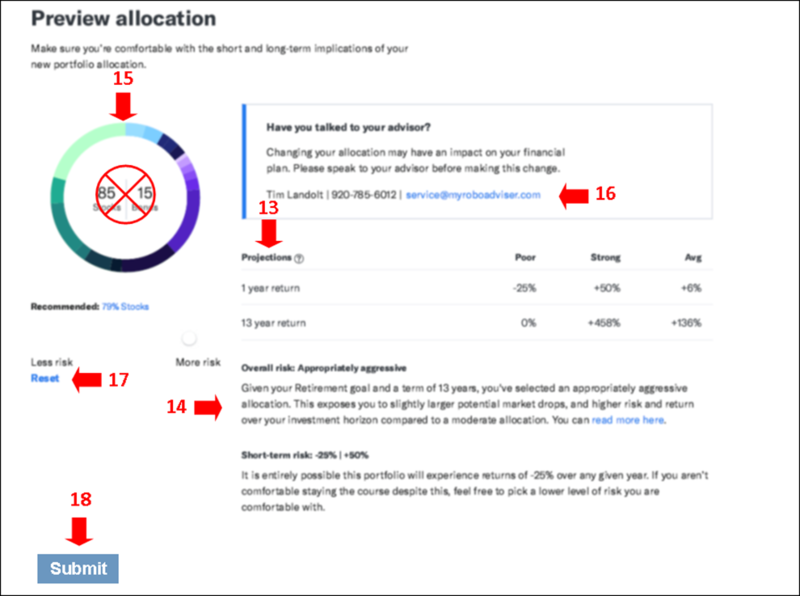 The portfolio allocation chart (15) is useful for looking at the specific allocation of the underlying holdings of the model number/prospective allocation. As you hover your mouse over the various sections, green represent equity positions, blue represents fixed income, and purple illustrate alternative allocations. The percentage of each position will show up in the middle of the pie chart circle. When you are not hovering over a specific portfolio position, the default % Stocks | % Bond allocation shown inside the circle (which we have crossed out in red) is not a useful data point for you because Betterment’s platform is constructed to illustrate allocations only in a 2-dimensional format. If you have questions about how to interpret the data on this page or about the recommended allocation, give us a call at (920) 785-6012or send an email (16) and we will be glad to help. If you do not wish to accept the model, click Reset (17) and then click the Advice tab to start over. If you decide to accept the allocation, click the blue Submit button (18) in the lower left. CAUTION: If you click the Submit button during active market hours (9:30 AM -4:30 PM EST), transactions will immediately occur in your account to adjust your portfolio to the new allocation. You should not click Submit unless you are certain you desire the new target allocation. Please note that only one allocation change can be made each day. If you Submit a change during closed market hours, transactions will occur during market hours the next open market session. You can check to see that your change has been recognized by clicking on the Activity tab at the top of the page. The pending change will display the changes you have requested that will be implemented during the next market session. If you have downloaded the Betterment app, you can log in to your My Robo Adviser™ account and make the above allocation from your mobile device. Changing your allocation from the mobile app is somewhat less complicated. Open the app, select the Portfolio you wish to adjust, click on the Portfolio tab in the upper right, then click on blue Adjust in the upper right corner of the app. You can slide the white circle along the grey bar and the numbers inside the circle will equate to the model number (equity goal target) . As you lift your finger from the white slider, the short and long-term projected percentage gains/losses table will update. If you are satisfied with the allocation and want to enact the change to your portfolio, click on the blue Submit allocation change bar at the bottom of the app. Confirm that your requested changes are reflected by clicking on the Advice tab. CAUTION: Clicking on the blue Submit tab at the bottom of the app will submit the trades. Transactions will occur if you click Submit during market hours. If you do not want to proceed, click Reset or the “X” in the upper right corner of the screen. Please note that only one portfolio allocation change can be made per day. If you have any questions about your current or recommended portfolio allocation or our 3-dimensional portfolio models, or your you can contact us directly at 920.785.6012 or email us at support@myroboadviser.com. My Robo Adviser™ has partnered with Betterment for Advisors as our technology solution to provide our services to our clients. Betterment maintains a support line you can also call for help with navigation or site functionality at 800.400.1571.